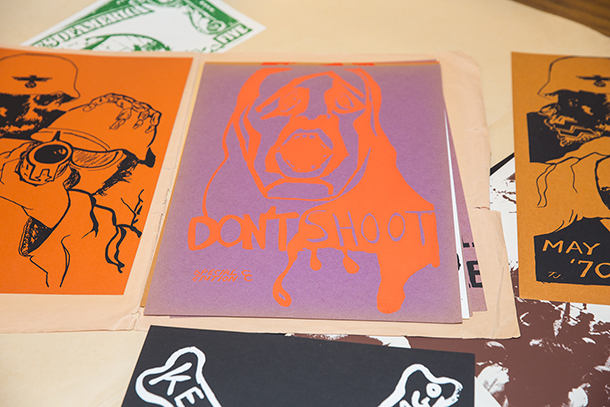 On one poster are the words “Don’t shoot.” On another: “What would happen if it was your child?” The posters were created by a little-known Columbia College Chicago student activist group in response to the violence at Kent State in 1970. 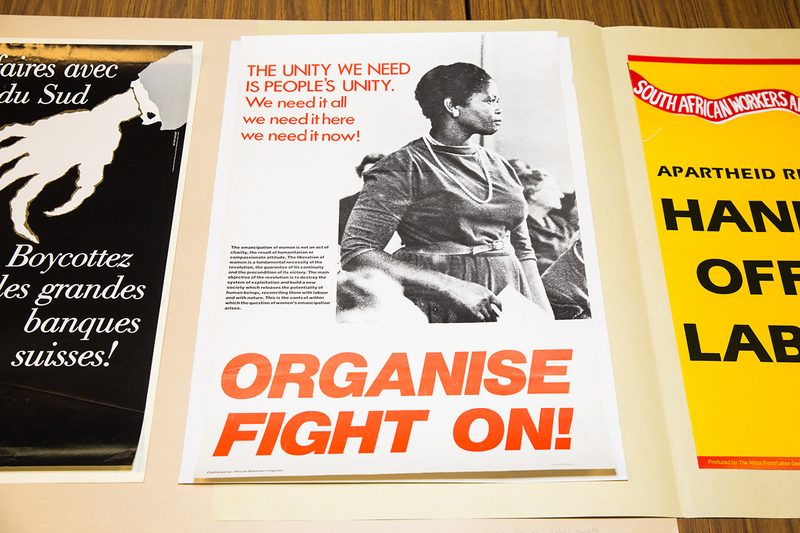 They are some of the newest additions to the College Archives and Special Collections (CASPC), an ever-expanding hidden treasure on the Columbia campus. When Marshall joined Columbia in 2005 to begin the college’s first archive, 40 boxes sat in a corner office of the Library. With that as a starting point, Marshall began piecing together what was then Columbia’s 115 years of material history. “We were grasping at straws, doing anything to reassemble Columbia’s history to show a more cohesive, unified history of the college,” says Marshall. Now, CASPC houses more than five million sheets of paper and more than 50 million digital objects on their website. In those early days, Digital Collections Specialist Dominic Rossetti ’06 braved through “many creepy Columbia basements.” Today, Rossetti and Marshall continue to find objects and artifacts from various places. It is not above them to dumpster dive, basement burrow, or scour eBay for that rare Columbia-related find. 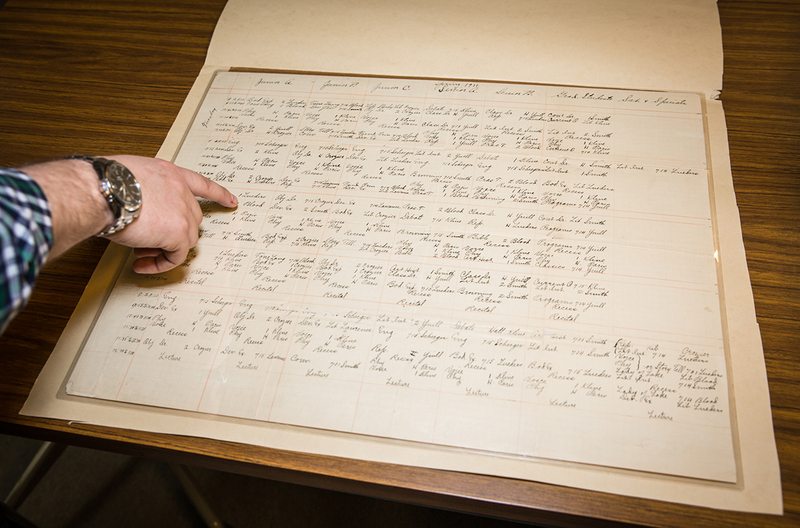 Along with establishing the college archives in 2005, Marshall and her small team built the Special Collections, largely a result of the many manuscript collections already present. With her team, Marshall gathered the disparate collections from various departments and centralized them into one space. Previously housed in the Library, the Archives and Special Collections are now in 619 S. Wabash Ave. The collections, which range from the Phi-Sigma Collection to the John R. Fischetti Manuscript Collection, support Columbia’s curriculum and are a valuable resource for researchers from all over. According to Rossetti, researchers from six continents, 192 countries, and more than 6,000 higher ed institutions have used the Archive’s site to access the digital holdings. 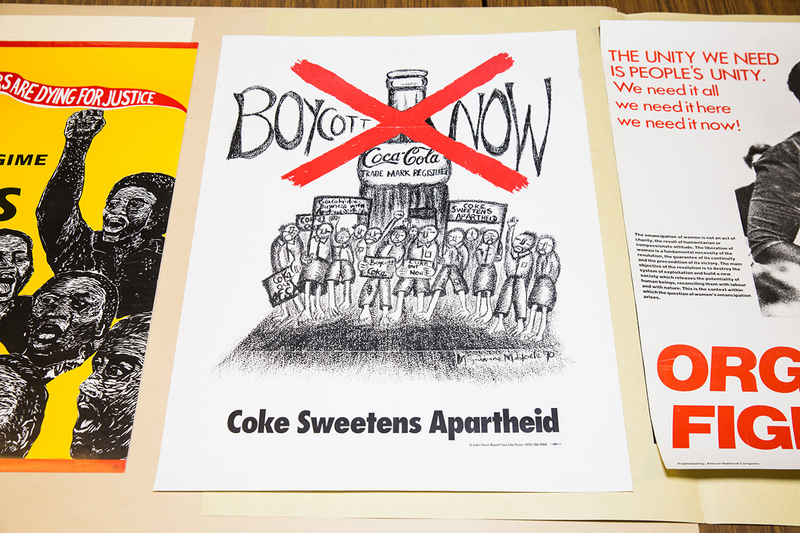 One of the biggest draws of the Special Collection is the Chicago Anti-Apartheid Movement Collection, which consists of more than 300 books, posters, and other material from the rich history of Chicago activism. Humanities, History, and Social Sciences faculty member Rozell “Prexy” Nesbitt personally donated much of the work from his family’s home collections. “It’s not our job to interpret. Our job is to steward the information and make sure it’s research-ready,” says Rossetti. "And to be factual,” adds Marshall. The two, who have worked in the CASPC for its entire 13-year history, point out that, as archivists, their work must be free of bias. “We don’t use a lot of adjectives or adverbs in our descriptions,” Marshall says. “We try to capture it all: the good, the bad, and everything in between. We do this so we can present it for future generations to interpret,” says Rossetti. Recently, an Interactive Arts and Media student requested access to old blueprints of one of Columbia buildings in order to render a building for a video game. “Researchers will always surprise you with their angle and it speaks to the creative process when people engage primary sources,” says Marshall. Currently, three student employees from various majors and interests assist in the Archives and Special Collections. On their blog, staff members and student employees chronicle the immersive experience of processing to how the archivist’s relationship to objects is “above” the function of a storyteller.